In 2015, for the first time ever, paracanoe athletes had the chance to secure Paralympic qualification slots at the International Canoe Federation (ICF) Canoe sprint and Paracanoe World Championships, with the sport set to make its debut at the Paralympic Games in Rio 2016. 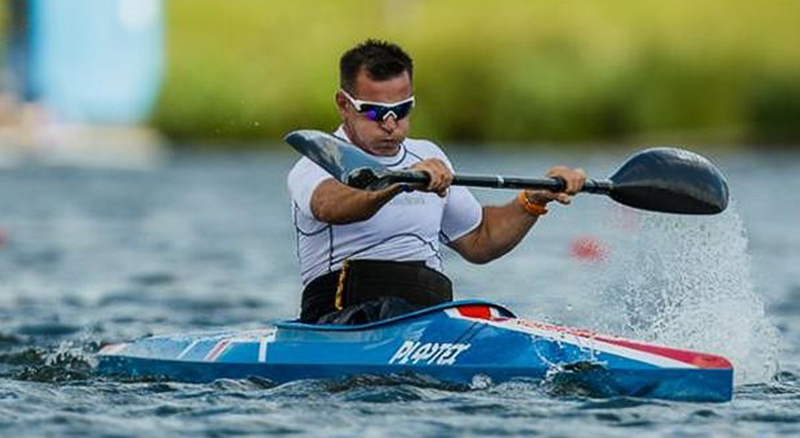 Early on Sunday 16 August 2015 I joined the GB Paracanoe team and flew from Heathrow to Milan for the Paracanoe World Championships where I was competing in the 200m Kayak (K1) flat water sprint. Day 1: Monday morning began with a couple of practice sessions to acclimatise to the new surroundings and conditions on the lake. The venue set up was good, mainly due to the organisation of the GB canoeing staff that flew out beforehand to set up base camp. GB always has the best base camp at any event and this year it was bigger and better. Day 2: The weather was hot and the water temperature the warmest I’ve raced on at around 31 degrees. After some constructive sessions on the water, which included race preparation and sprint practice, the initial reaction to the course from the feel of the water and air temperature was: it’s going to be a fast race! Day 3: My heat was at 09:10 in lane 7. This meant an early start with breakfast at 6am and down to the course to warm up. Again the weather was good with a slight headwind which was switching to a cross. Since the European Championships in May 2015 I had been suffering with an elbow injury, which caused a lot of pain and restriction on arm movement; I was hoping it would all be fine. Unfortunately it wasn’t, the problem persisted and I was not placed high enough to avoid a semi-final race later that day. This was a first for me, so after collecting my thoughts and having some treatment it was time for my semi-final and to do it all over again. The wind was blowing in a different direction – and the feedback from other athletes was that it seemed like conditions were fast, but actually felt surprisingly slow on the water. The wind had more to play in the overall conditions than we first thought. My semi-final was an improvement on my heat, but not good enough - having to put power through my arm was taking its toll on my ability to perform. This now meant I had qualified for the B Final which was the following day at 14:40 Lane 4. Day 4: After an early night to mentally prepare and further treatment for my elbow, I awoke refreshed and ready to go and with the decision to drop my stroke rate, so that my body could last longer during the second half of the race. This was my final chance to show what I could do. The crowds were larger than the previous semi-final and the noise from the drums and air horns generated far more excitement. I had a clean start out of the bucket and started to pull away approaching the second half of the race, maintaining my lower stroke rate as I stayed out in front and ......SUCCESS...........I was over the finish line first! So much better! If only I had performed like that in the heats I would have been looking at a podium placement with my time of 54 seconds! Still you can’t win them all and on the up-side I still hold the world record with the fastest time of 49 seconds....... and have secured my place in Rio!